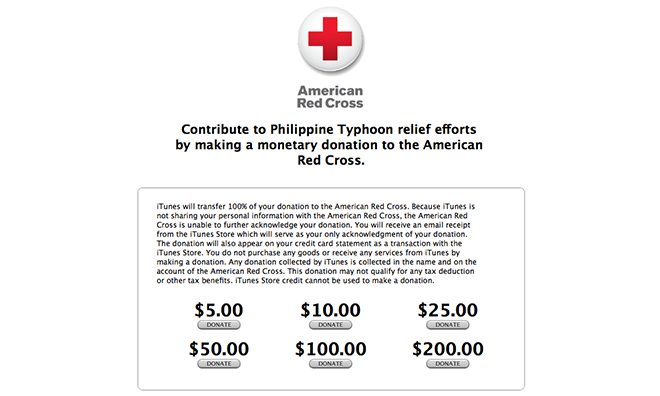 Following Typhoon Haiyan's landfall and subsequent battering of the Philippines, Apple is now accepting donations via iTunes to help Red Cross efforts in the region. As it has done before, Apple is helping streamline disaster relief donations to the American Red Cross via iTunes, this time for Typhoon Haiyan, which ripped through the Philippines last Friday. According to the Chicago Tribune, the massive storm typhoon killed an estimated 10,000 people, with that tally expected to rise sharply as rescue efforts travel to more remote cities and villages. The US and UK are sending military naval vessels to render aid to the roughly 660,000 people displaced by the tropical cyclone. Apple is advertising the effort on its homepage. Because the service is linked to iTunes, users can charge donations to credit cards on file simply by signing in and clicking the "Donate" button. Increments range from $5 up to $200. The iTunes/Red Cross donation system was recently used in 2012 to help victims of Superstorm Sandy. Prior to that, the service was activated following the devastating earthquake and resulting tsunami that hit Japan in March 2011, as well as for a series of earthquakes in Haiti. Those interested in sending aid can visit Apple's website or click here.